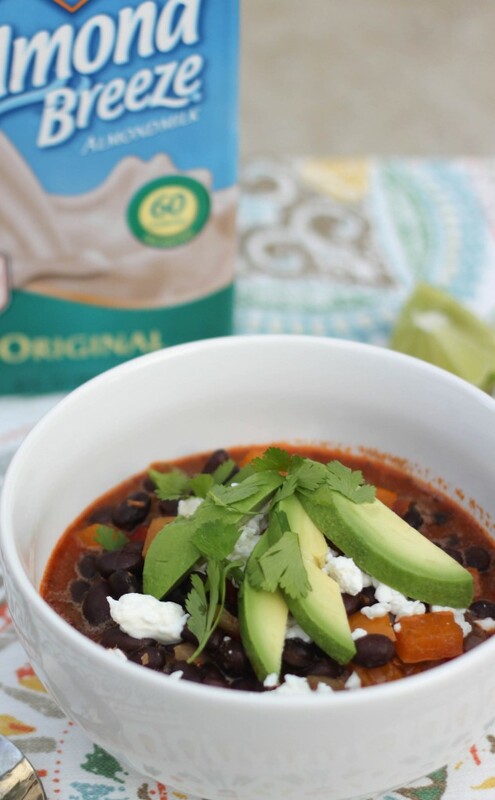 This Black Bean Soup Recipe is sponsored by Blue Diamond Almond Breeze. Oh friends, do I have an awesome spring dinner recipe for you. Whenever I see my Uncle E the chef, he gives me amazing cooking tips. He is the mastermind behind this salmon, this vegan sushi, and the best pasta salad you will ever have in your entire life. We got to spend some time with him this past weekend, and while he gave me a TON of recipes, the most interesting one was a black bean recipe. He told me a story about how they were never his forte, and one of his friends from Key West taught him the tricks to making incredible black beans. I’ll go ahead and tell you the secrets: first, sauté your veggies (onion, peppers, garlic, don’t be stingy with the veggies; the more the merrier). and some broth to finish it off. BOOM. Perfect black beans. 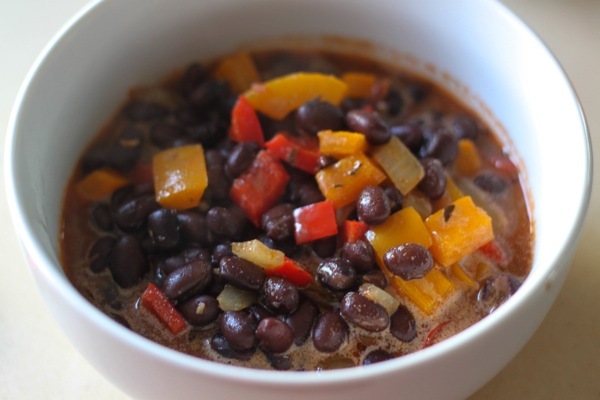 Of course, I had to try this method as soon as I could, and after we destroyed the first batch, I made another and turned it into a glorious black bean soup. I added some Almond Breeze for a hint of creaminess, a little chicken broth, and topped it with goat cheese, avocado, cilantro and lime juice. 1. 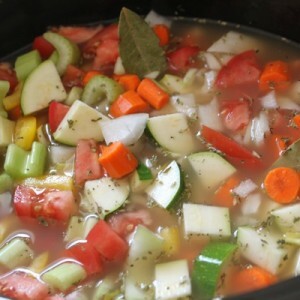 Heat a large saucepan to medium, and add a splash of olive oil. 2. Add you bell peppers, onion and garlic, and cook, stirring frequently until aromatic and slightly softened. 3. Add the seasonings, and stir to fully coat the veggies. 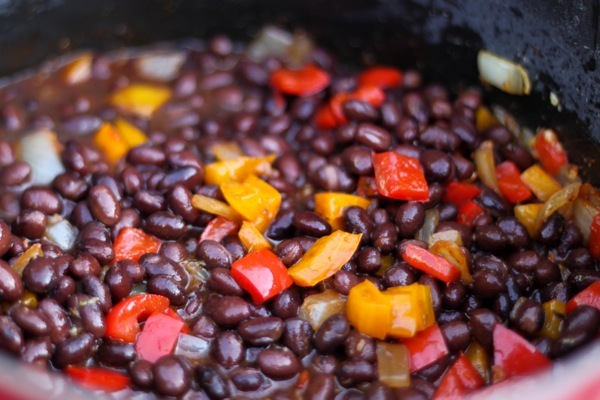 Reduce the heat to low and add the black beans. 4. Next, add your marinara sauce and stir well. 5. Gently pour in the Almond Breeze and broth, stir to heat through (but do not boil) and season to taste with salt and pepper. 6. Serve into bowls and top with crumbled goat cheese, cilantro and lime wedges. Any random secret ingredients you like to add to certain things? I like to add a pinch of sugar to marinara sauce, and (as I learned from Rachael Ray back in the day) a bit of nutmeg to casseroles. Anything is better with almond milk! 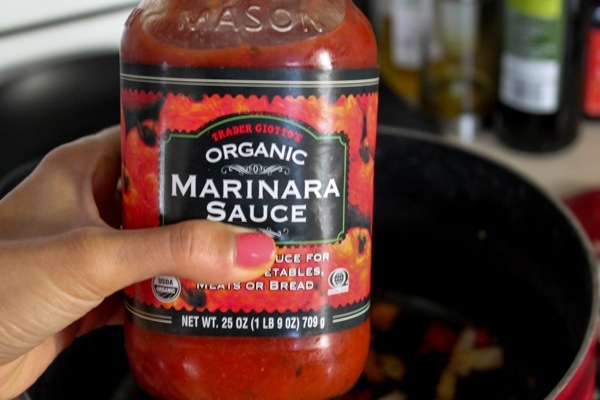 Definitely going to try the marinara trick. Thanks for the tip Gina! Aack, this sounds so good! And I just had Panera’s soup the other day and thought it was pretty good, but I bet this is loads better. Will definitely try! Sounds so creamy and delicious! 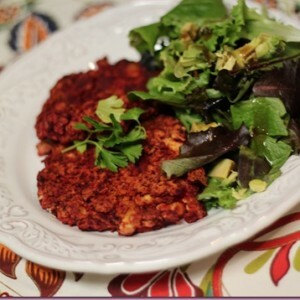 Looks healthy and delicious! Thanks Gina & Uncle E :). I do like black beans, but sometimes they can be a little overwhelming. I will have to try out your way and see how they turn out! my mind is blown. 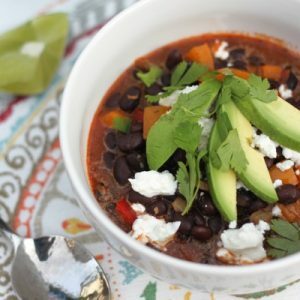 i love black bean soup and am definitely going to give this a try. Ohhhhh Gina this looks fantastic! I am definitely making this. Drooling. This looks awesome! Going to put it in the meal plan for next week. I’ve had a couple of soup fails recently so I’m looking for a win here! Update: delicious!! So easy and boyfriend tested and liked too. Adding this one in to the saved file! Thanks! 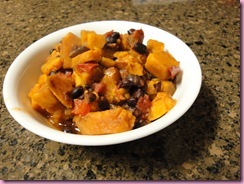 I make a variation of this, instead of marinara though I add pico de gallo and sweet potatoes and spicy sausage. It’s amazing, and it’s SUPER quick to make. I picked up the pico de gallo tip off another blog and I think it’s brilliant – all the yummy veggies and none of the chopping! 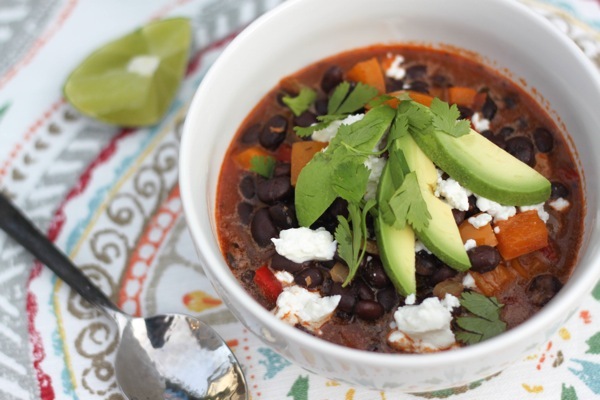 Ahh, I love black bean soup! Thank you for sharing the secret! 🙂 I can’t wait to try this! 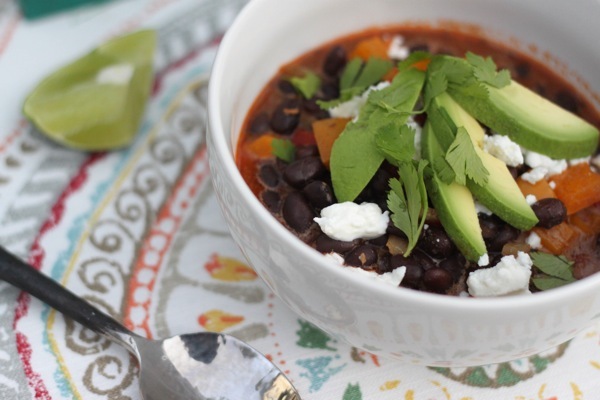 We make our black beans exactly this way, but have never added broth at the end. My family jokes that my husband is more Mexican than I am because he triple adds all the spice, and puts cilantro on everything. Definitely going to try! I tried it. It’s good! Well, I added way more broth, and whirred most of it in the blender, and topped it with jalapenos, cheddar, sour cream and tortilla strips. But I think the marinara was a nice addition. I don’t know if the milk did anything but maybe! 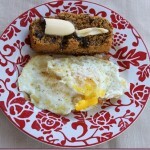 My base recipe is very similar, but without marinara or milk. I like the pico de gallo tip someone posted, too. Thanks! Tried it! Love it. Thanks! I like your chana masala too. Tried it and I loved it!! going to be a staple 🙂 Thank you for sharing. This is ridiculously good! 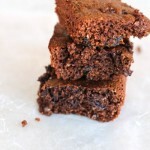 My husband keeps asking me to make it again (and when I do make it, I do a triple batch). I used less onion, but then added more seasonings. I did try freezing a portion of this soup in the freezer to pull out another time. It tasted fine when thawed, but the consistency was not quite the same.